Just a look around the shack so I can remember what it looked like before packing everything out when we sell the house. 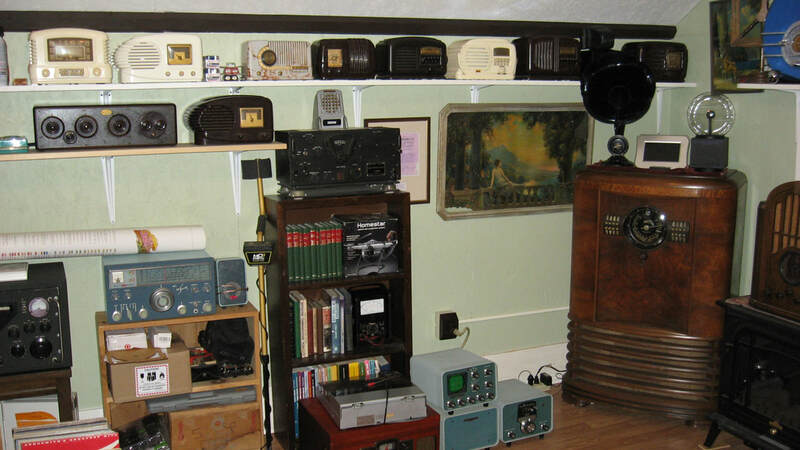 Most of the spare parts and some of my antique radios have already been moved to the new place. Most of the rest stays until the SOLD sign is hanging out front. This picture is several photos combined and the stitching software really stretched and distorted the image on both sides. Visible are a Knight Kit T-150 Transmitter on top of the blue shelf, alongside a cosmic blue National NC-190, plus a restored Sony TC-651 reel-to-reel tape deck and a Collins 51J4 along the wall next to another National receiver, a cosmic blue NC-270. On the shelves are Bakelite radios, mostly from the 1940's and on the small book case is my BC-348. 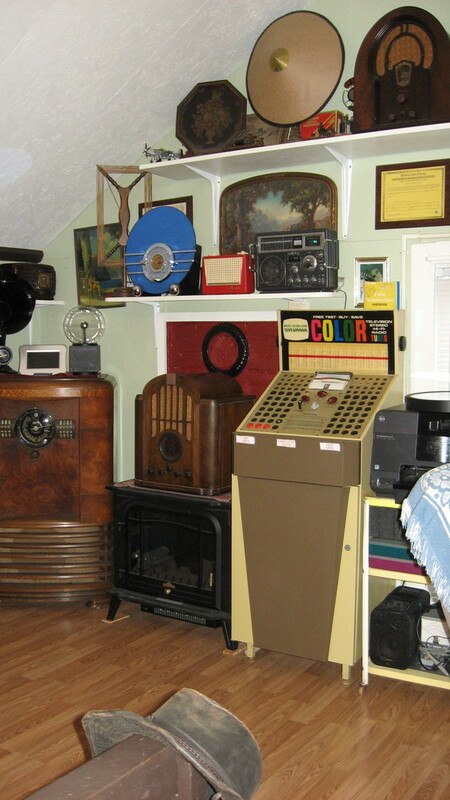 There's also a restored 1934 RCA 143 shouldered cathedral sitting to the left of the tube tester and a 1932 Philco 91 cathedral, a 1920's Metrodyne speaker and an RCA 103 speaker on the top shelf. The Sparton Bluebird on the mantel is a reproduction. My restored 1939 Zenith 9S367 Robot Dial console occupies the corner. The robot dial was a new innovation for the 1938 model year and Zenith added the all new Radiorgan and Transcontinental Tip-Touch Automatic Tuning features for 1939. Back then radios had to have new features every year just like cars and the new models came out in the fall of the previous year same as cars. So this 1939 model came out in the fall of 1938 and was priced at $99.95 (that would be about $1700 in today's money!). ​I have 2 or 3 other Robot Dial models waiting to be restored when I get moved to the new shop and I plan to add a separate page for my robot dials.